JibberJabberUK: H is for...Ho, ho, ho! You can find it on cards, wrapping paper and decorations. When Father Christmas laughs he doesn't say, “Ha, ha!” or, “He, he!” but a big, hearty, “Ho, ho, ho!” from the bottom of his round, wobbly tummy. So where does Santa's famous laugh come from? In truth I've searched and searched and I can't definitively tell you. Just about everything else to do with Christmas you can find an origin be it religious history, local customs, a description, an illustration in a book or magazine or popularized in an advert, for Ho, ho, ho! it's a no, no, no! 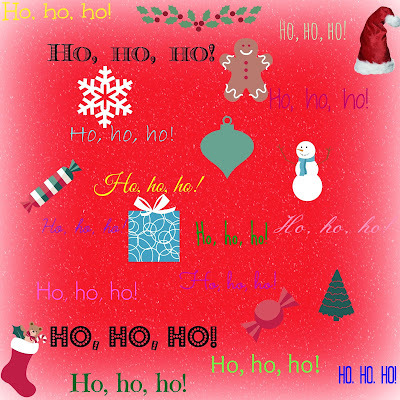 I've seen that the term “Ho-ho-ho” has been recorded as a form of expressing laughter from as early as 1150. Where it was written down in 1150 I don't know. Apparently in the 19th Century the term, “ha” when used when laughing or as an exclamation was changed to, “ho” when written in books. Which books? I haven't the foggiest. It's also been said that it has its origins in Irish Gaelic. Proof? I can't give you any. The famous Shakespearean character Puck in Midsummer Night's Dream says, “Ho, ho, ho; coward, why com'st thou not?” So many common English words and phrases come from Shakespeare but I think it would be a very tenuous link for this example. The last Ho, ho, ho! reference I can give you is Canada Post have a special Christmas address which is Santa Claus, North Pole, H0H 0H0, Canada. So where does, “Ho, ho, ho!” come from?